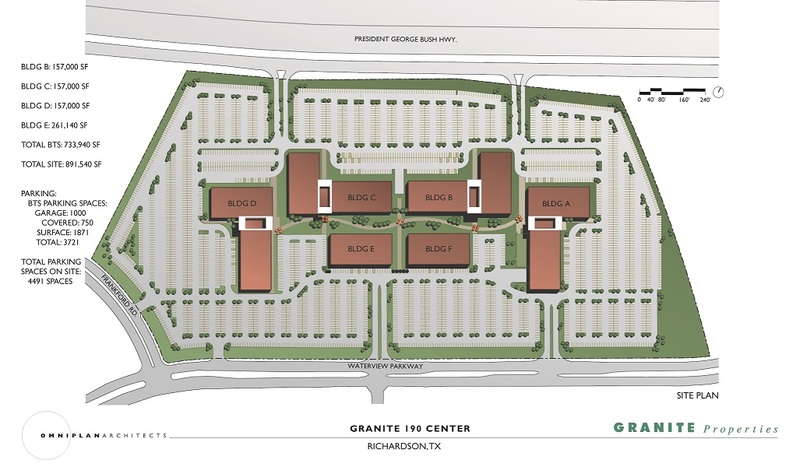 Granite 190 Center is a 3-story 6-building master planned campus in Richardson, Texas totaling 725,000 GSF. Parking is provided at 5.0 spaces per 1000 SF. The master plan is organized around a central landscaped spine connecting all six buildings and providing an outdoor amenity for the office occupants. This spine is also used to provide a central utility spine rearing all buildings. Phase I of the project is a 159,000 SF build-to-suit for White Rock Networks. The master plan is designed for flexibility to accommodate future build-to-suits and structured parking.